Found in the Mojave and Sonoran Deserts of the southwestern U.S. and northwestern Mexico, desert tortoises are listed as a federally threatened species under the Endangered Species Act. Desert tortoises inhabit areas with well-drained, sandy loam soils in plains and alluvial fans. They live in areas with native grasses and remain in underground burrows when they are inactive. They’re even able to live where ground temperatures may exceed 140 degrees F! In California alone, desert tortoise habitat has been reduced by 50 to 60 percent since the 1920s and habitat destruction and fragmentation is still a threat. Roads serve as corridors for invasive species, which have particularly detrimental effects on native desert grasses that tortoises depend on. As new roads are built, they attract ravens, natural predators to tortoises. 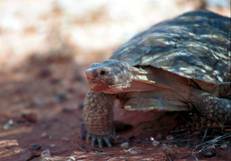 What can you do to make a difference in desert tortoise recovery? ❖ If you see one on the roadway, carefully and safely move the tortoise onto the side of the road that it was facing. ❖ If you encounter a tortoise in the wild (not on a road), leave it alone. ❖ Keep the desert clean and don’t litter. Tortoises can get tangled in trash, and garbage attracts ravens and other predators that feed on desert tortoises, their eggs and hatchlings. ❖ “Raven-proof” your trash. Stash it in containers with tightly secured lids and don’t put it out until collection day. Make sure dumpsters are closed and secure at all times. ❖ Encourage landfill managers to reduce raven attractants. ❖ Don’t water your lawn to the point it runs over the curb or fills in depressions. Water early in the morning when soil is most absorbent. ❖ Landscape with native plants. ❖ Encourage power companies to inspect their lines for raven nests, to remove any they find and to install underground lines whenever possible. ❖ Keep dogs leashed at all times. ❖ Don’t drive, bike or walk off trails or roads. ❖ Watch for tortoises on roads and trails. ❖ Don’t release pet tortoises in the desert. A pet tortoise probably won’t survive in the wild and may infect resident tortoises with disease. ❖ Stay informed. For up-to-date info on desert tortoises, visit this site.